It seems everywhere you turn there's another article or piece of content that highlights the importance of health and wellbeing. For the biggest sector of the American population, the Baby Boomers, that information is even more prevalent. Our team works closely with healthcare and senior living industries as we focus on food and beverage service and understand the need, pressure, and desire to meet the ever-changing needs of the older population. 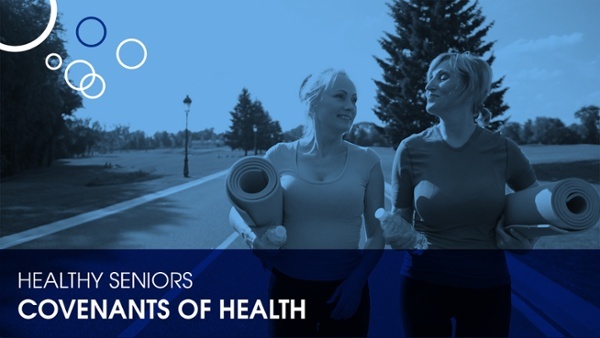 We created a short video that highlights the five covenants of senior health - a video we believe is a perfect summation of all the information available on the topic. You've probably heard the adage "drink eight glasses of water a day!" since you were younger. Eight might be an arbitrary number and one without a necessary variable for the actual water equation: how many ounces are actually required in that math? The daily water theory is all over the board, but a good place to settle is based on your own body's math. Aim to drink eight ounces of water for every 20 pounds bodyweight. An illustration would be if you weigh 150 pounds, divide by 20 = 7.5, multiplied by 8 is 60 ounces of water per day. Hydration doesn't have to strictly come from water; think of other non-sweetened beverages that could count towards your daily goal. Tea, sparkling water, even coffee have good water ratios per serving. Still falling short? Consider water-dense foods like soups or broths (just make sure they're low sodium) and fruits and vegetables like watermelon, cucumbers, and celery. Over the years, our sleep patterns and habits change which is reflective upon the stage of life we're in. Babies and children require lots of sleep while adults require less. For a lot of the population, sleep dwindles and dwindles over the years as we tend to end up subsisting on less and less of the precious recharge time. Contrary to belief, seniors don't need less sleep than average and according to WebMD, adults require about the same amount of sleep from their 20s into old age, although the number of hours per night varies from person to person. If you feel like you've unsuccessfully tried most suggestions for better sleep, talk to your doctor or therapist. Insomnia and restlessness are common in seniors, but relief is possible. If there's a fountain of youth, it's at the other end of a treadmill. That might be an oversimplification, but the emphasis on exercise and movement through all stages of life has never been more encouraged than in today's society. Maintaining a healthy body, mind, and spirit is all supported through exercise. As people age, exercise and physical movement look different - as it should. What your body was capable of at 25 or even 45 might not be what you're capable of at 60, 70, or 80. Nor should you assume that's what your body needs at any of those ages. More than anything, your heart needs to pump and feed your cardiovascular system. Your joints and muscles need to stretch, move, and loosen up. Your mental health and outlook need to be stimulated with new environments and activities. A great recommendation for exercise is aiming for 150 minutes per week; if you break it down by day you're only committing to a little over 20 minutes per day. And exercise doesn't always have to mean the traditional, gym-based sense of movement either; consider walking the dog, walking a round a golf, mowing the lawn or raking leaves, even dancing at events. Be creative and be relentless in your pursuit of activity. There hasn't been the focus on mental health like there is today perhaps at any other time in history. Health and well-being aren't just physical; mental health and cognitive awareness are just as crucial to one's overall portrait of health. As perhaps one of the most important covenants of senior health, mental health's stigma is changing for the better. No longer is it expected that individuals won't seek help or support for mental health issues. In aging adults especially, there's a focus on support, understanding, diagnosis, and resources. Seniors often have more triggers or instances of isolation, loneliness, and changes in cognitive health. Understanding what's a normal part of aging and what can be supported with the help of professionals is important for wellness. There are certain risk factors that play into mental disorders, and the World Health Organization suggests 15 percent of individuals over 60 have some form of a mental disorder. Just as you regard your body's physical health - treating it well and seeking help when something is off, mental health requires the same dedication and mindset to live life the most fully.